Occasionally, like most museums, we will get a “box” in the mail. Someone is cleaning house, and either they want to remain anonymous, or they absolutely, definitely do NOT want anything returned. So, there is no return address. Last week, I received such a box, carefully packed inside were a New Hall Braillewriter (serial# 3268, nothing special), and an old record album box full of drawing tools. 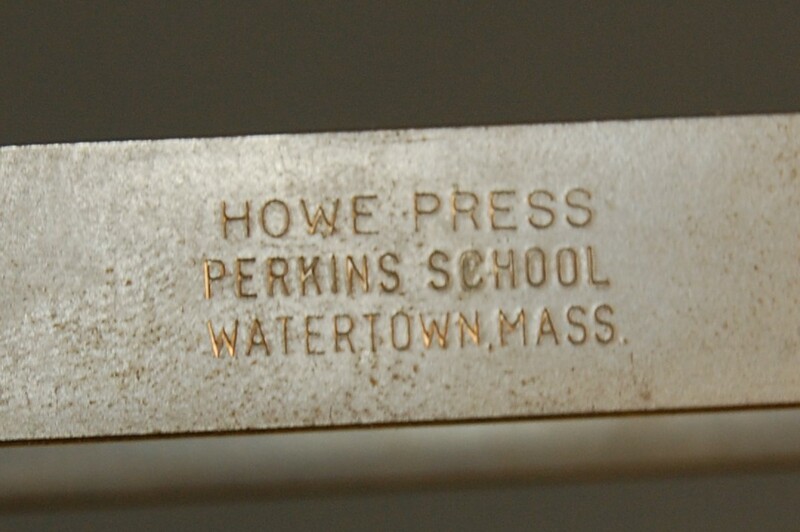 There were eight in total, all stamped with the Howe Press/Perkins School mark. Now, I’ll admit, I don’t really like receiving these boxes. Without documentation, we can’t establish ownership, and we’re reluctant to expend resources on things we do not own. But these tools help tell the story of how our field made it possible for students who are blind or visually impaired to succeed in classes like geometry, or to make all sorts of maps and diagrams. So our Throwback Thursday blog is a little long this week. Mea culpa. In 1939, Edward Waterhouse, a math teacher at the Perkins School in Watertown, Massachusetts, was designing pioneering appliances to teach mathematics. Waterhouse would go on to head both the Howe Press and the Perkins School, and was an influential educator in many ways. In 1939, there were no commercially available adapted tools that would allow students with visual impairments to draw raised lines for themselves. The production of tactile graphics was consigned solely to the braille presses who were producing maps, or to individual teachers making their own diagrams using tactile materials, glue, and household tools. By 1941, the Howe Press, the manufacturing arm at Perkins, had introduced “Geometry Instruments,” which we think meant a compass with a star wheel, a braille protractor, a tracing wheel, and three braille rulers. 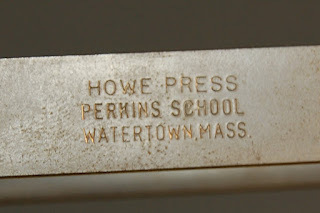 In 1947, the Perkins Annual Report says that their geometry instruments were being made at the Howe Press machine shop, now in Watertown (having moved that year from Boston). In 1950, the category was renamed “Mathematical Instruments.” You could buy all six drawing tools in 1956 for $13.45. Meanwhile, Harry P. Sewell was part of an ad-hoc research council in the 1940s in New York that met at the American Foundation for the Blind. He received a patent for his own raised line writing system in 1952. By 1955, Sewell was manufacturing the kits in a small shop and distributing them through AFB. (A version is still available today from MaxiAids.) Sewell’s kit involved a clipboard with a rubber coating, a plastic stylus, and a clear plastic film. Pressing the stylus into the film (or into aluminum sheets) produced a raised line drawing on the opposite side of the film. Whether inspired by Sewell, or encouraged by the steady sales of their drawing tools (we don’t really know the whole story yet), by May of 1968, Howe Press and Perkins had introduced their own drawing kit, the Raised Line Drawing Kit (RLDK). It consisted of a rubber-faced drawing board, a nylon tipped stylus, a tracing wheel, a twelve-inch ruler, a protractor, a compass, and a right angle, along with 100 sheets of ten-inch square Mylar. Like the Sewell Kit, the RLDK produced a raised line drawing on the opposite side of the Mylar. By 1976, Howe had also introduced their Freehand Drawing Stylus, a tool allowing you to place individual raised dots anywhere on the page. The American Printing House for the Blind got into the act originally in 1965, introducing its Swail Dot Inverter, a hand tool, designed to emboss raised dots to create simple charts, graphs, and maps. In 1980, APH introduced its Tactile Graphics Kit, which was intended more for teachers than students, but included a variety of tools to emboss graphics of all types on heavy gauge aluminum that could then be reproduced on a conventional thermoform machine. 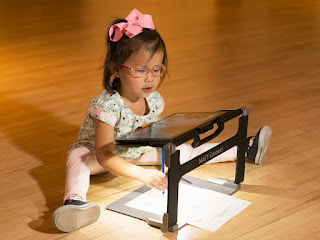 But the most important contribution APH made to student produced graphics would come in 2005, when the company introduced its Draftsman Tactile Drawing Board. Like the Sewell and the Raised Line Drawing Kit, the Draftsman used a rubber coated board and clear plastic film. But unlike its predecessors, when a stylus was drawn across the plastic film, it left behind a raised line on the top of the film that could be explored by touch immediately.